Discussion in 'The Shop' started by kingbee, Apr 14, 2008. I am putting some Avid cable disc brakes on my wifes Trek hard tail. 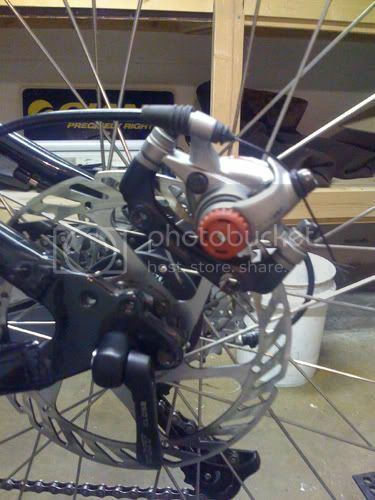 I used to have these brakes on my park bike, so they already had the adapter on it. Then I ran into a problem I have never had before. The rear adapter holes are at a different spacing. The frame holes are at 1.75" (44mm or 45mm?). My adapter is for 2" (51mm). I haven't found an adapter yet for this size. Can someone point me in the right direction? The frame is either a 2004 or 2005. Heres some pictures. Im starting to even wonder if they are disc mounts. But I dont know what else they would be. Its only on the disc side. Those sure don't look like disc brake adapters to me. Look more like fender mounts. Arent those usually on both sides though? 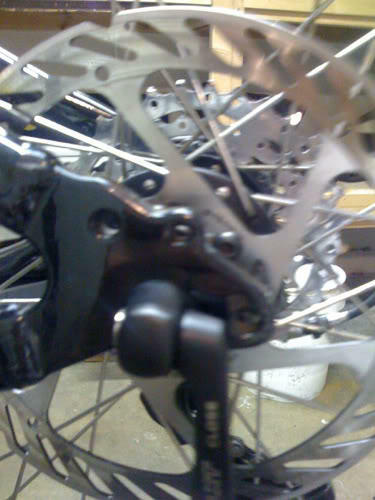 They dont look like disc brake mounts to me any more either. Now Im just not sure what they are. Are there two mounts on the drive side as well? No, just the disc side. That dropout probably came from the "parts bin" and is intended for rack/fender mounting. You might be able to get a custom adapter made but I'd be nervous about using it since that dropout isn't really designed for discs. I was thinking the same thing. I could get an adapter made for it. But I wonder if the drop-out could handle it. Naah. I have seen a lot of early disc mount designs break chainstays. I would consider getting a new frame anyway. If the dropout had a lot of fender mounts, I doubt it is a sub 3lb race frame. You could buy a modern mountain frame for about $200-300. Well I found out Trek makes a special bracket. I have my LBS tracking one down. Just ordered one for $15 through the LBS. Yeah, I remember seeing that. Pretty neat idea, if the bike isn't using discs, then the adapter can be removed, saving weight (for all you weight weenies).